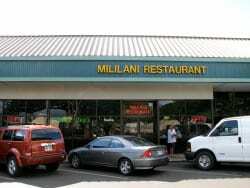 Mililani Restaurant, located in the original Mililani Shopping Center in central Oahu. This humble restaurant serves up large portions of local favorites from Portuguese Fried Rice to Fried Saimin. So if you want great food and to go where the locals eat, come on in and check us out! A: Yes we do. We deliver with a purchase of $700.00 or more. Q: How much is your delivery fee? A: Delivery is $20.00 anywhere in the Mililani area. Outside Mililani is a flat rate between $80.00 to $120.00 for the delivery fee. Q: How many people will your pans feed? Mililani Restaurant was first established Bill’s Fish & Chips in 1978. In the restaurant’s humble beginnings, the restaurant menu was small yet tasty. Some of these items were our chicken katsu, shoyu chicken, fried saimin and fried rice. Now, over 30 years later, as the restaurant expanded, so did our menu. Not only do we still make the same great foods but also we do catering for parties and events as well. Our food is made fresh to order, so it’s served hot and delicious when you get it. Our desserts are homemade by us along with our saimin and udon noodles.